Farniente is a small publishing company set up by, Gabriel Cabello, Antonio Dafos, and Jose Antonio Murciano (editor in chief of the publishing company Comares in Andalucia) and Sergei Furst. We are dedicated to occasional publications of collaborative conceptual art projects and writing that spans the gap – with varying degrees of elasticity – between fiction and essay. 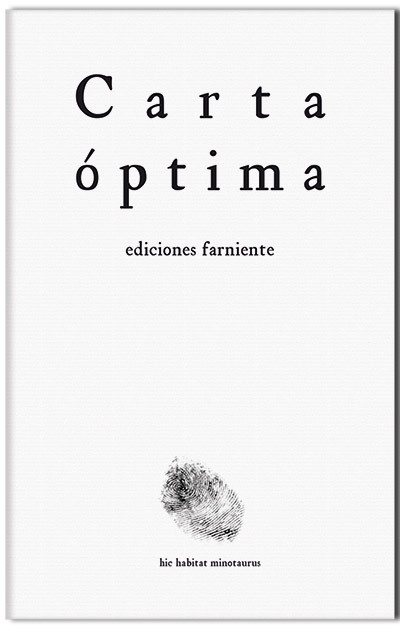 The last book we published was Carta Optima (The Optimum Suicide Note), a challenge laid down to a number of writers and artists in Spain, with Furst as the initiator and curator of the project. Contributors included Juan Carlos Rodriquez, and the writing collective Vacations in Poland (Vacaciones en Polonia).